Dr. Cardeccia attended Michigan State University, where she received her BS in Animal Sciences in 1991 and her DVM with honors in 1995. She has practiced small animal medicine and surgery since 1995, moving gradually from general practice to veterinary physical medicine starting with her acupuncture class in 2007. At this time, she is a second year Resident with the American College of Veterinary Sports Medicine and Rehabilitation, following the Practice Experience Pathway. 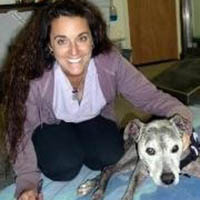 Now focusing exclusively on rehabilitation and integrative healing methods, Dr. Cardeccia is a Certified Veterinary Acupuncturist, Certified Veterinary Food Therapist, Certified Canine Rehabilitation Therapist, Certified Canine Massage Therapist, and is certified in Animal Chiropractic by the American Veterinary Chiropractic Association. Since graduation, some of her other continuing education pursuits include obtaining certification in Advanced Avian Medicine and Surgery through the North American Veterinary Post-Graduate Institute, as well as holding a certification as a Pet Loss Bereavement Counselor. Dr Cardeccia ha also co-facilitated a Pet Lost Support Group in Livingston County with her sister, Kimberly Cardeccia, LPC. Dr. Cardeccia is committed to providing compassionate integrative veterinary care based on the needs of her patients and the beliefs of their human families.